Max: The Curse of Brotherhood explores age-old curiosities like ‘would I regret wishing my brother had never been born?’, ‘what would happen if my magic marker was literally magic?’, and ‘how would that magic marker behave if it were possessed by the soul of an old lady?’. 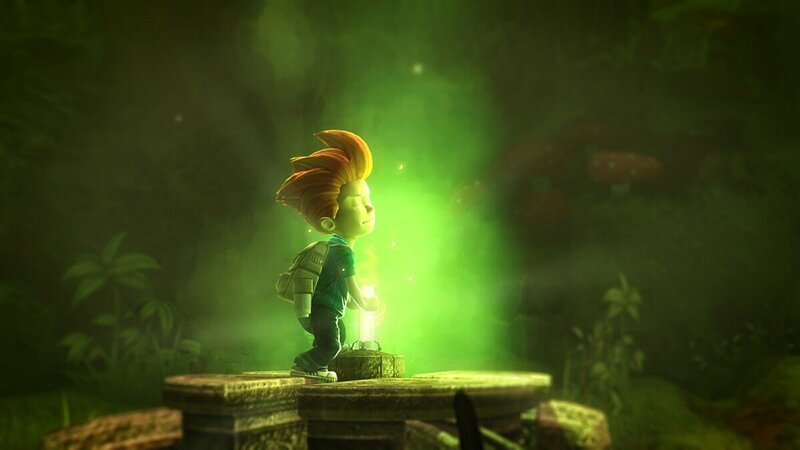 Max: The Curse of Brotherhood sets out its premise quickly: you are a (roughly) ten-year-old boy named Max who, irritated by his brother’s incursion into his room, searches the internet for a quick curse to erase his brother from his life, only to immediately regret the decision and follow him through the wormhole that whisks him away. Naturally, your brother is instantly kidnapped and you must run, jump and solve puzzles on your way to save him from his captor. Your companion is the aforementioned magic marker, which grants you the ability to manipulate the terrain around you in order to progress. You raise ground to create pillars for climbing, draw tree branches as platforms and vines for swinging, create water plumes to catapult you across perilous drops and launch fireballs to take out minions or open up new paths. Each of these powers is gained by discovering a series of not-so-subtly named ‘Holy Places’ and the pace at which you acquire the powers is perfectly balanced. Max: The Curse of Brotherhood briefly shows you the power, gives you the power, then dumps you in the bottom of a cavern and challenges you to master your power to escape and progress. Perhaps the most impressive facet of Max: The Curse of Brotherhood’s design is that the addition of each new power changes the way in which you can use your existing powers. Tree branches become makeshift platforms, then become rafts, then become cannons. Max: The Curse of Brotherhood makes full use of its mechanics and the game is at its most fun when it challenges you to find innovative uses for your powers in order to solve environmental puzzles. Visually, Max: The Curse of Brotherhood looks like a playable version of a children’s TV show — an art style which has aged relatively well in the four and a half years since its initial release -— however the story unfortunately also attracts those same parallels. You arrive and are met by the ostensibly ‘good’ character who is immediately convinced that only you can banish the ‘ancient evil’, in this case a cackling old man named Mustacho. 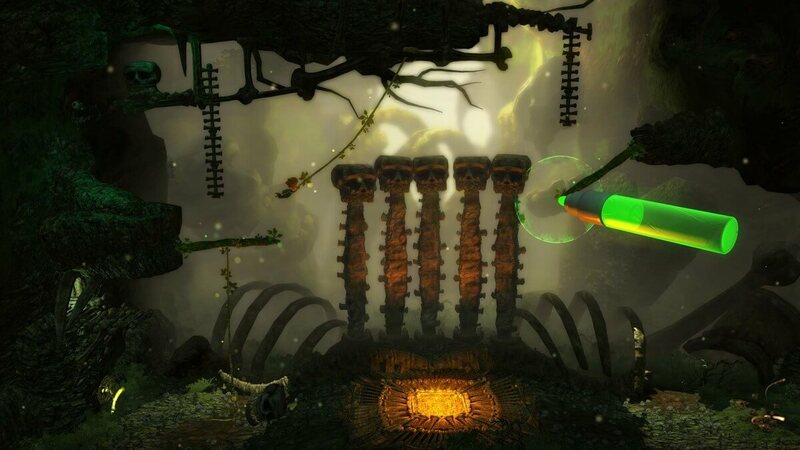 The story is only a skeleton on which to hang the gameplay, putting pressure on the gameplay to provide the hook — a test that, thankfully, the game passes more often than not. However, Max: The Curse of Brotherhood also struggles to offer a consistent enough challenge. Most areas are immediately passable with the briefest of consideration, which serves only to make any difficulty spikes frustrating rather than rewarding. Throughout, there is the option to collect sections of an amulet by navigating to much harder to reach areas. 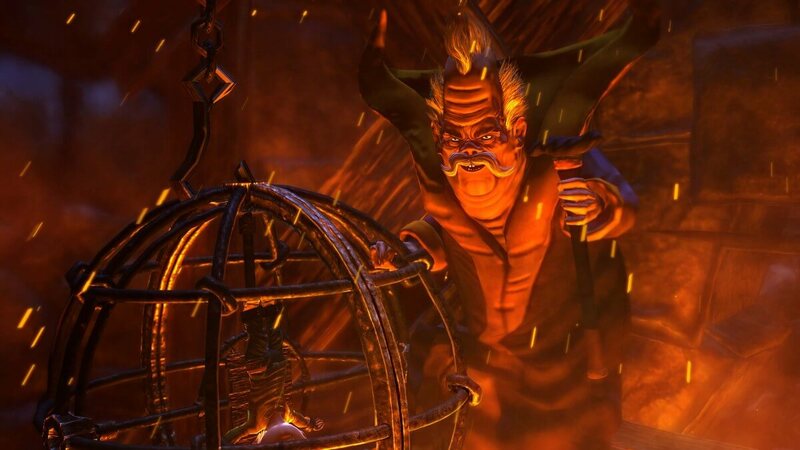 These are usually the best puzzles in the game and Max: The Curse of Brotherhood could offer more collectables or challenges such as these to engage the more experienced player. Following in a long line of Switch ports, Press Play’s 2013 platformer came to Nintendo Switch in December of 2017, however Max: Curse of Brotherhood is structurally built for the Switch. Seven chapters are split up into smaller sections, each around ten to fifteen minutes long, bringing the game’s running time to roughly seven hours depending on the strength of your urge to collect. This makes Max: The Curse of Brotherhood perfect for on-the-go play. Short journeys can give you enough playtime to make quantifiable and satisfying progress, which is a serious plus compared to large, open-world games where fifteen minutes may amount to meandering listlessly in a field. Where the port is less successful is translating the controls to the Switch. There are occasions where Max: The Curse of Brotherhood builds up excellent momentum in a chase sequence or otherwise, only for that momentum to be stifled by cumbersome controls. Moving your marker to where it should be or where you want it feels heavy and unresponsive, undoing some intelligent puzzle designs or straight up causing you to die. Ultimately, Max: The Curse of Brotherhood is a charming but frustrating experience. Its mechanics are simple, but interact brilliantly to become far more than the sum of their constituent parts — and yet the game leaves you feeling like they aren’t used to their fullest. There is an excellent basis for a very good game in Max: Curse of Brotherhood and the occasions where its positives coalesce concurrently make the game worth picking up, but they are too few to make it essential. Max: The Curse of Brotherhood is available for download on the Nintendo eShop, as well as on Xbox One, PS4, and PC.